I’m pretty sure that you would be able to guess this by now, but I LOVE going to concerts. There is something so fun about going to see your favorite performers and bands live- to hear your favorite songs, to hear the excitement in the crowd, to see the band get amped up while playing- it’s the best!!! 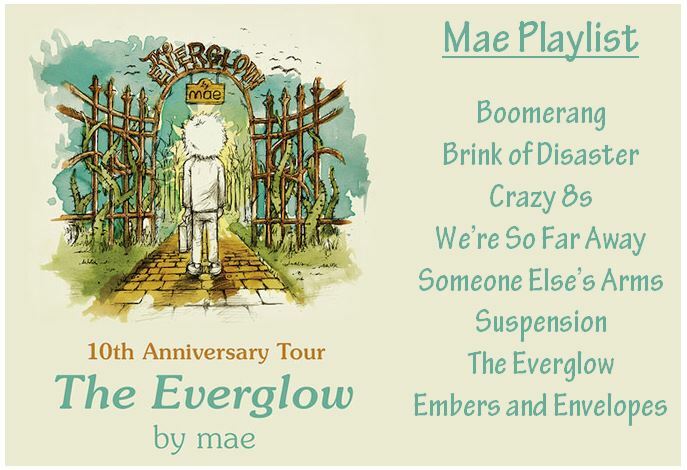 I saw that Mae (one of my very favorite bands from high school) was coming to Dallas as part of a10th anniversary tour for their cd The Everglow and I REALLY wanted to go! But, I didn’t want to shell out $25 to go to a concert by myself, so I held off buying a ticket. The website where I found out about the concert had a contest to sign up to win 2 tickets…. and I WON! They emailed me to let me know I was the big winner less than 24 hours before the show… not last minute at all. I went to the concert with a co-worker and we had a blast! The concert was in Deep Ellum and it seemed like such a cool neighborhood- I can’t wait to get back there and explore a little more! The first opening band was really really good (Mike Mains & The Branches), the second opening band was ok (All Get Out), and Mae was FANTASTIC! My buddy was such a trooper (he had never heard of any of the bands playing) and he didn’t make fun of me when my inner 17-year-old emerged and I sang and jumped around to every single song. I put together a little Mae playlist, or Mae-list, with my favorite songs- give them a listen and enjoy! I didn’t realize Mae got back together. I saw them a few times in 2004 and 2005. They were great live, good to hear they’re still solid. I’ll have to see if they’re coming to the west coast. Thanks. It’s in three days! I’ll have to think quickly. I’m not too familiar with their material after The Everglow (and to be honest I didn’t listen to anything regularly besides Destination: Beautiful). Wonder why it’s so expensive. They only played songs from The Everglow and Destination: Beautiful!! It was great! Dang. Now I have to seriously consider the 24 bucks and 2 plus hours driving. haha. At my favorite venue, too.